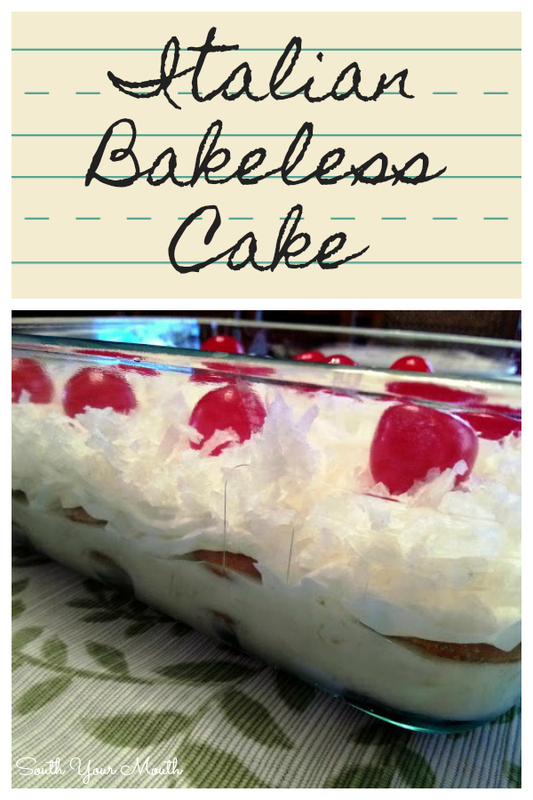 A layered dessert with sweetened condensed milk, lemon juice, pineapple, vanilla wafers, cool whip, coconut and cherries. Here lately, Angel Baby has really taken an interest in cooking. So for Thanksgiving, Mama remembered an old recipe Nanny used to make that's super easy and got the stuff so AB could make it all 100% by herself. This recipe's at least 40 years old and I have no idea why it's called an Italian anything but, as I've said before, we Southerns will give something an international name a minute! Whisk together sweetened condensed milk and lemon juice in a small bowl until thoroughly combined. Mix in pineapple with juice then set aside. Line the bottom of a 2-quart glass baking dish (typically 8x8 or 7x10) with vanilla wafers. Pour all of the pineapple mixture over vanilla wafers then add another layer of vanilla wafers on top of pineapple mixture. Spread cool whip evenly on top of vanilla wafers then sprinkle with coconut. Top with cherries then cover and refrigerate at least 4 hours before serving. What would mandarin oranges (diced) and or bananas do for this recipe ??? I think they would be lovely! Possible substitution and use lady fingers instead of wafers? You can use whipped cream and make it fabulous! This sounds fabulous!!! Trying it soon! The cookies soak up the liquid. Where can I find the cherries at I never seen any in the stores would jar cherries do just a s well. Jarred maraschino cherries are what I used. Thank you for this site. This cake is beautiful and so is your daughter. Anna, at the grocery store near me they are in the canned fruit aisle, maybe try the baking aisle as well. May even have them down the alcohol aisle for use in mixed drinks. LOVED it!! My oven busted a few days ago(too hot to bake, anyway)and I have been craving goodies!! I was so amazed at how quickly and firmly the pineapple mixture set up!! I made homemade whipped cream, adding cream of coconut and Mexican vanilla--awesome addition without a lot of work!! Keep up the great work and wonderful blog!! Do you really mean 2-3 cups of coconut? That sounds like a lot for that size pan? I really do! But use as much as you like. I make a cake similar to this- however I do not use condensed milk. I use vanilla pudding with cold milk and mix the pineapple juice and pineapple with it. Also layer banana slices on top of the wafers. I also added some Amaretto to the Pineapple and juice and a little anise extract. Thank You for the Share!!! I don't care for pineapple....but I love cherries or blueberries. Could i use pie filling instead of the pineapple. Well... no, I don't think that would work because you mix the pineapple with the milk and you need the pineapple juice to make the right consistency. Maybe dice up canned peaches or pears?? If you decide to try something, I'd love to know how it turns out! My Mom does something similar to this but instead uses bananas, pudding and the vanilla wafers. Very yummy too! I'm gonna try this Tuesday :) My mother and sister come over every Tuesday night for dinner and are my guinea pigs! I will let you know how it turns out! I wonder, could you use peaches or Fruit cocktail for this? would it be as good? Maybe slivered or sliced almonds? what else could you use other than coconut...I am allergy to coconut? I can't really think of an alternative until you use ground nuts of some sort. You can just leave the coconut off if you like. Perhaps try crushed corn flakes or sugared flakes? Slivered almonds? Candy nonpareils? Or just leave it plain? I just saw this recipe posted by a friend on Facebook and, in fact, was wondering why it's called "Italian". I've lived in Italy for 40 years now, and we don't even have any of those ingredients over here, except for maybe the lemon juice! Even maraschino cherries aren't Italian; they're Croatian in origin. If you'd read the post, you might have found your answer there. But thanks SO MUCH for taking the time to write and share your sunshine all the way from Italy!!! What kind of vanilla wafer?? Nilla? Nilla would be fine though I'm sure I used the store brand. I would like to make this in a 13 x 9 pan...should I just double everything evenly? Yes, I think that should work out nicely! My friend made your recipe for my family and it was FABULOUS!! Best dessert i've had in a long time. 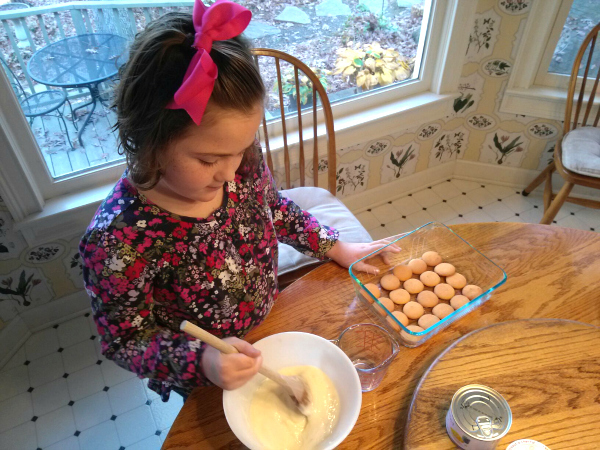 Thank you for sharing the recipe and your family. Love the idea of this and summer's almost upon us Downunder so will give it a go next time I have to take something to a dinner - it's a bit much just for me on my own. Had an idea, it's a bit of a long shot but, do you think it's possible that, instead of wafers this was originally made with Savoiardi Aka Sponge or Lady's Fingers and called Italian Cake because of it? Please don't shoot me down I promise I read every word of your post. Lol. LOL... I try not to let the nasty comments get to me but sometimes I can't resist firing back! Especially when it's obvious the person didn't take the time to read the post before releasing the hounds. But ya know, I think you might be on to something! That would make sense to me! My momma made a lemon pie with that lemon/condensed milk mixture and the acid in the lemons thicken it up to pudding like consistency. Adding in the pineapple, whipped cream and coconut would be like combining her fabulous pie and her best ever 'fruit salad' in one bowl. All I can think is HEAVEN. Thanks for this!! Yes, mix both the pineapple and the pineapple juice in with the sweetened condensed milk and lemon juice. My Daddy's family is from Northern Florida and Georgia and.we traveled cross-country every other summer. 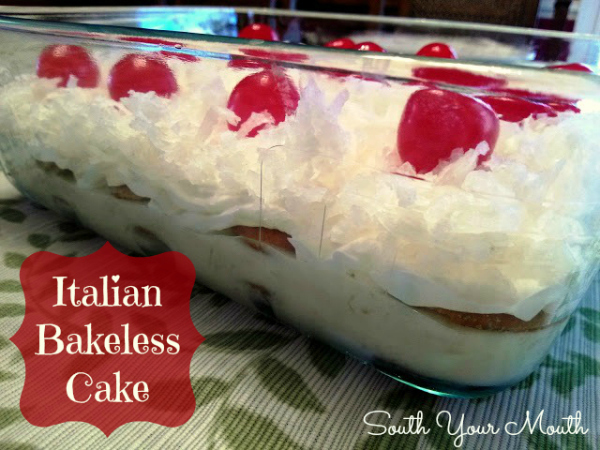 My southern relatives think I have a split personality; I'm "a CA Yankee with cane syrup runnin' through my veins because I LOVE Southern Food, My southern Granny taught me to make this "Italian bdessert; we increased the recipe so that we used large new washtubs to insure that we'd have enough,. They called it a " BANANA SPLIT CAKE"; the ingredients were fresh and made from scratch. In addition to the wafers, pineapple, coconut and cherries we also added 2 layers of thinly sliced bananas, and also some fudge(or chocolate sauce}. I've seen it MANY TIMES at "a dinners on the ground". A WORD OF CAUTION: The aroma alone of this dessert may add inches where you'd least like them. My Yankee and Southern sides agree- this recipe is definitely easy to assemble, and is guaranteed to tickle your taste buds; ENJOY!! Sounds like a Heavenly dessert for Christmas time. I'll make it and let you know. Can't wait to try it. Yes. It reacts with the sweetened condensed milk to thicken it. pineapple & juice, but it sure sounds yummy! I made this for Thanksgiving and it was a complete flop!!! There has to be creamcheese or something mixed in with the pineapple and the condensed milk!!! I hate paying that much for ingredients and it was all wasted!! I am very disappointed. You must have done something wrong! I just came over here to thank Mandy for yet another PERFECT recipe and was shocked to see this comment. My MIL gave me this recipe I know she and at least three other people have made this and LOVED it. Just like we did. And sorry but this is one of the cheapest dessert recipes I've ever made so to complain about "paying that much money for ingredients" is ridiculous too. OK, that's my 2 cents! You have to add the lemon juice to the pineapple and sweetened condensed milk in order for the mixture to thicken and set up. Since you didn't mention the lemon juice in your post, I'm guessing that you didn't add it. That is what you did wrong. If this recipe was a flop, you didn't follow the recipe as written.........and that's my 2 cents worth!! You must have omitted the lemon juice. It is what thickens the mixture. You really shouldn't call something a FLOP when you don't follow the recipe. That's your fault not Mandy's. These folks are right. On all counts. Follow the recipe and you'll love it. And you won't need to be so shouty. Mandy, thank you for ANOTHER great recipe! Your site is my new go-to for recipes! And don't pay any attention to the above comment. It's ridiculous! My MIL introduced me to your site and now my whole family eats recipes from it regularly!! Make with real whip cream not cool whip, add chopped pecans on top of the coconut, any fruit and juice to match equally to the pineapple and juice at 8 oz will work & last but not least use a gourmet product in place of the vanilla wafers. It just elevates it a little but doesn't require any extra work really. Also I added on the bottom a cream cheese layer under the milk layer the last time I made it for someone by using cream cheese and powdered sugar whipped together to desired sweetness. I did use the pineapple but added a few fresh blueberries to it as well because her favorite fruits are pineapple and blueberries. She loved it I did not try it so can't say. I think this could be topped with any type of nut or even chopped fresh fruit instead of the coconut and cherries. I would also use real cherries not jarred. My grandmother said she knew someone who used sliced pound cake instead of vanilla wafers. Ohhh that's interesting might have to try. Hi Mandy, I made this and the only problem I had was the last part of the recipe, letting it sit for 8 hours. lol This is delicious. My question is, can you freeze this? I made your chicken scratch and cooked a whole chicken in the crockpot for Sunday dinner, was awesome. Made the greasy rice too. I love your site. Can't wait to try the other recipes. This sounds delicious!! I will be making it Easter weekend for my family! Made this great cake and my family loved it ! Will make it for the holidays! Can this be made in a 8 x 8 square baking pan ......instead of a glass dish? Can you dpuble this recipe for a crowd and put in a 9x13 dish? Are will this size be enough for a crowd? Yes! It doubles perfectly in a 13x9 dish.